Discussion in 'LSx Development and Modification' started by Bigfella237, Dec 8, 2015. I've been compiling this list for quite some time, hopefully it will help identify these engines when offered as replacement or conversion units in the future. Please note that this list is a work in progress and while all care has been taken, being based mainly on information found across the internet, I make no guarantee as to it's accuracy. If anyone can confirm, contribute or correct please do!! 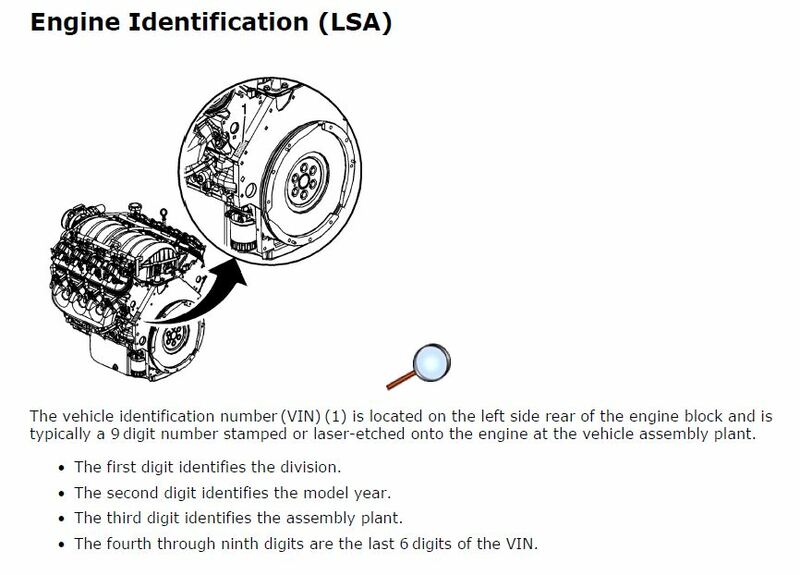 NOTE: Although it came from the Australian Service Manual, I believe the above image (for the LSA) is incorrect? I haven't found very many examples of Supercharged HSV GTS vehicles but those I have seen do not follow that format, I believe the picture above is the American format which uses the vehicle's VIN? The only exception to the above nomenclature (for engines fitted to Australian vehicles) are the hand-built LS7 motors from the "GM Performance Build Center". 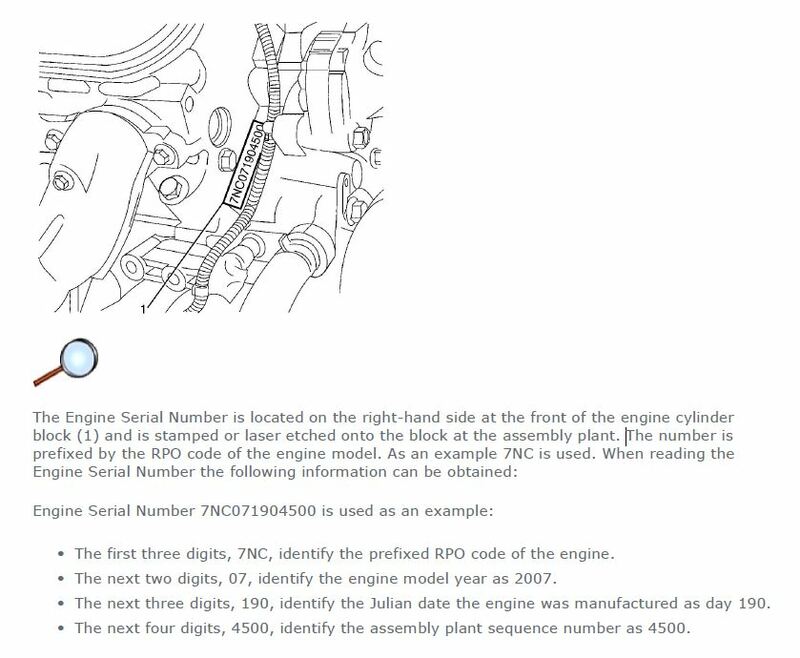 These "RPO codes" or "Broadcast codes" or "EUN prefixes" (or whatever you want to call them) supposedly change with every "Model Year" (MY) whether the engine spec changes or not. Holden (Australia)'s MY traditionally starts on September 1st; and GM (America)'s MY traditionally starts October 1st; but going by the engine numbers, these broadcast codes mostly seem to change around the middle of the year*. I assume this is to compensate for a lead time of up to three months between the start of the engine model year and the start of the vehicle model year? *NOTE: Typically around June or July but this is by no means a strict rule, every engine MY appears to have a different start date? NOTE: All Gen III LS1 and some very early Gen IV LS2 engines fitted to Holden & HSV vehicles had a "VF" prefix regardless of fitment or transmission. Before anyone comments, yes I know there were technically no Series II & III VZ's, it's just easier to delineate them like that. Again, if anyone can offer more information, please do! Please DO NOT QUOTE THE LIST ABOVE in your reply as it will not be updated like the first post will be and may give somebody out-of-date information. The GM Performance Build Center (PBC) at Wixom, Michigan began production in 2005 with the 7.0L Gen-IV LS7 for the C6 Corvette Z06 and the 4.4L Supercharged Northstar LC3 for the Cadillac STS-V and XLR-V.
Due to market conditions the LC3 was discontinued after the 2009 model year; at the same time, the Supercharged 6.2L LS9 was added to the production lineup for the MY09 C6 Corvette ZR1; and finally a hand-built version of the 6.2L LS3 was added for the MY10 C6 Corvette Grand Sport. All of these engine models were hand-built from start to finish by an individual builder who's name appears on a plate attached to each engine he or she built. All had dry-sump oiling systems and were only available with the "MZ6" Close Ratio Short Throw 6 Speed Manual Transmission (any automatic vehicles received regular production line built wet-sump LS3 engines (ie. not from the PBC)). "Complete Assembly" and "Long Block" (without accessories) crate engines were also produced, along with dedicated race engines. Starting MY11 GM introduced the "Corvette Engine Build Experience" where customers could not only observe but actually participate in the building of their own specific engine as ordered. There were three "Assembly lines" at Wixom (A2, A3 & A4), any engine could be built on any of the lines, however: A2 was generally used for the LS7 or LS9; A3 was generally used for LS3 or LS7; A4 was generally used for customers that had selected the "Corvette Engine Build Experience" (which slowed the build time considerably) and more recently A4 was used for producing the COPO Camaro and other race engines. Each line was near identical, consisting of twelve stations that were set up and programmed for performing the specific tasks required for assembly of engines. For example, station 1 involved: examination of the cylinder block; installation of camshaft; mounting block onto rollover stand then torquing block to stand; torquing cam retainer plate; and torquing cylinder block plugs for oil galleries and water jacket. All torques for all three lines were accomplished using bar code scanners and electronic torque equipment. Some were accomplished using multi spindle machines that torque more than one bolt at a time. All torques had to be correct to move forward and all were permanently stored in the computer. What was produced did vary from day to day depending on orders received from Bowling Green and orders received from SPO for crate engines, so the lines were set up with the flexibility required to meet the fluctuation in demand. There were many safeguards in place to prevent errors that could occur when producing different engine types. For example an LS9 build would not allow an LS3 torquing. You must always scan for the correct engine for the equipment to work, and you cannot move forward until all previous torques are successfully completed. At peak production in MY07 the PBC turned out an average of 30 engines per day, but dropped to as few as 10 units per day on average in MY12. On January 30th 2013, General Motors announced the relocation of the Performance Build Center to the Bowling Green, Kentucky Corvette Assembly Plant, effective first quarter 2014. Note: This total does not include crate engines (either full builds or long blocks) nor COPO Camaro or other race engines. All engines including completely assembled crate motors (such as fitted to the Australian HSV W427 models) were test run before leaving the PBC, with the exception of long block crate motors, which could not be run as they had no accessories fitted. All LS7 long block crate motors = "H61"
All LS9 long block crate motors = "J55"
MY11 customer build = "B84"
MY12 customer build = "B85"
MY13 customer build = "B86"
Once the PBC was moved to Bowling Green at the beginning of 2014, it was retooled for the new C7 Corvette which has the newer Gen-V LT1 & LT4 engines, although I believe they do continue to produce the Gen-IV dry-sump crate motors, however I haven't yet been able to discover the EUN prefixes used. I've added that to the list. I'm starting to see why nobody has tackled a list like this before, it's a LOT more complicated than I first thought! I finally found a decent auction website that actually lists engine numbers, but it shows a whole heap of prefixes I've never seen before. It now looks like Holden changed prefixes with every model year (MY), not just every model? I'm still sorting out the details but I have new prefixes of 2AR, BBC, BBD, BW6 & SBK to add to the list, I just have to figure out how to identify the vehicles they came from? I recently sold my April 2006 built VZ Clubsport, 6 speed manual and the LS2 had VF as the engine prefix. I have added the page out of Holden HSV workshop manual below. I was a bit doubtful about that "6MC" entry in the list, but I have seen pictures of it and was told it came from a Holden dealer who said it was a replacement LS2 for a VZ HSV auto, some of those very early LS2 engines were a mish-mash of old Gen III and newer Gen IV parts anyway so it doesn't surprise me that your LS2 had a "VF" prefix? Firstly a MY11 VEII Commodore SSV Redline 6sp manual sedan with a "1AM" prefix. This seems to clash with the other MY11 VEII prefixes of "BBC" & "BBD". Was there such a thing as a MY11.5? With the example numbers I have, the "1AM10233****" predates the "BBD10256****" by 23 days (Aug 21 vs Sep 13), remember that engine dates are usually about two months before the vehicle build date so both of these prefixes should be well into VE Series II. Secondly an E3 Series HSV Clubsport auto sedan with an "AMD" prefix. That's the earliest Gen IV HSV I've found that didn't start with a "Z". LS2 was a gen IV in the VZ range starting from 2004. Yeah I should have worded that differently, how about... It was the first HSV engine number in four years not to start with a "Z" (that I know of anyway)? We still need a lot more data to get a clear picture, if anyone knows of a website similar to those auction sites above that lists engine numbers please let me know and I'll start logging all the info? Now found a third auction website that gives engine numbers, although only three Commodores on there right now one of them adds yet another new prefix to the mess that is the VE Commodore. Also found a MY10 WM Caprice with a "BBC11005****" number, which got me thinking... historically Holden have always made Statesman (and later Caprice) engine numbers distinct from other models, adding an "11" or "12" in the early years or an "S" or "C" prefix in VQ onward, do they still do that I wonder? It's a MY12 VEII Commodore sedan with an engine number of "2AB11278****" but it doesn't specify the transmission? I've been trawling the auction sites for a week now and I've added a few new "broadcast codes" to the list on page 1 but it's slow going. I thought auctions would have a much higher turnover but I'm just seeing the same vehicles listed all week with an odd new one added now and then, trouble is there doesn't seem to be any way of just viewing the new additions, I have to go through the entire list every time to check if I have the engine number recorded already? I've added another new engine number prefix "DGB" to VF Series I on the list on page 1. I've also added a heap of information on the hand-built LS3, LS7 & LS9 motors to the second post in this thread, which HSV W427 owners may find interesting. The search continues on the various auction sites but it's slow going. I'm especially looking for info from anyone who has a 6.0L VZ, more specifically an L98 equipped VZ wagon or ute, I feel like there's more to that story that needs explaining? Engine # 2AB111790203, L77, AUTO, 9/11 MY12 VE11 SSV SPORTS WAGON. What I found interesting about this, if your formula is correct, my engine was # 203, built on the 28th of June. I thought it might be the financial year but that doesn't work either???. It would be about right to find it's way into a Holden in September. Thanks for the reminder Scott, I've been a bit slack checking the auction websites for numbers recently but I'll have to get back on it? I've found a few new examples but I've adopted a rule whereby I wait until I find 2 or 3 of the same prefix before adding them to the list, just in case of typos (been finding HEAPS of them on the various sites). Thanks Bluey, I've updated the list. I'm only looking for V8 engine prefixes here so the LY7 numbers aren't much use at the moment, maybe someone should start a list for the V6? Hey guys, I have a 2010 VE Series II, that has had an engine replacement the new engine number is; LFW*130560015* (yes, it has the asterisks in the engine number). I am struggling to find any sort of info on this, can anyone help out? 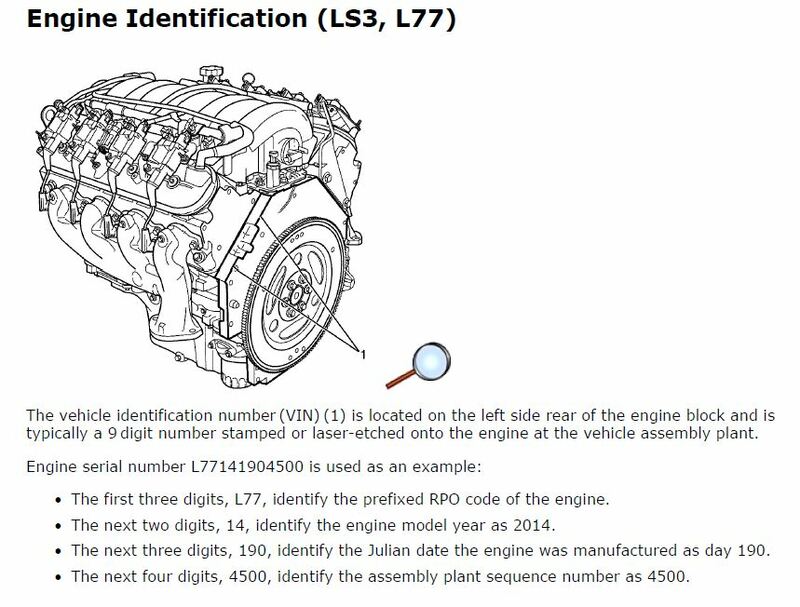 Sorry, I'm only dealing with V8 engines in the above list, most of the V6 engines are prefixed with the actual RPO code anyway, yours for example being an LFW engine, although it does seem strange to see the asterisks. If you google "LFW engine" you'll find all the information you could want, except that your particular engine number was generated February 26th 2013, (and was the 15th produced that day). Engine # 7NC061570084, L98, AUTO, 8/2006 VE SS-V Sedan. If your formula is correct, my engine was build #84, built on the 6th of June (06/06/06(insert X-files theme music)) .